Traditional sandbagging using a backhoe and thousands of volunteers can take days or even weeks to put up a dike to protect from oncoming floods. When the flood is over, try to find a single volunteer to remove the dirty rotting sandbags. Sandbags hold contaminants like sewage, pollution, riverbank seepage, bacteria, bio hazards, etc. It is a federal mandate, that sandbags cannot simply be dumped in the local landfill, but must be taken away and disposed of as hazardous materials, at a great expense. The Tiger Dam™ system may be able to contain spilled bio-hazardous materials, wastewater and terrorist intended chemical liquids. The 90 second rapid deployment diversion Tiger Dam™ weighs 65 lbs. when empty, can be immediately filled to 50 feet holding 6300 lbs. of chemical liquid or slurry type mixtures. Simply use a 2″ pump to pump the sand/debris into the tube. The tube becomes an airtight holding tank, with over 6000 lbs. capacity –remove as weight capacity changes with the density of what it is filled with. Once contained in the holding tank, the spill can be pumped out at a safe and convenient time into a bio-hazardous tank truck/water truck and disposed of according to environmental standards. Contact us for more information on the use & deployment of Tiger Dam™ systems. Any Idea of How Many Dams There Are in USA & Canada? While there is not a lot of data on how many communities could be effected by an event that required any of these dams to release large quantities of water to retain integrity or in the event of a catastrophic breach it is evident just by the sheer numbers of dams in North America that there would be serious repercussions. For any of these communities’ forward thinking and preventative measures should include a Tiger Dams™ System and the training to effectively implement the system in times of flooding. US Flood Control can provide these services. For more information on how to start your Tiger Dams™ program give us a call (504) 813-7303. If you are looking for information regarding flood control, why not join the team of US Flood Control at the iAEM Conference (International Association of Emergency Managers) today and tomorrow at the Westin Long Beach Convention & Entertainment Center in Long Beach California. Connect and get information on Tiger Dams™ systems and find out about Us Flood Control’s training programs. Most resorts and resort towns are built close to water. Many are ocean side and subject to whatever those immense bodies of water throw at them. Many others are built on lakes throughout the Americas and around the world. The great lakes are a perfect example as many large cities and small resort towns are built along their shores but many others are smaller but no less prone to the whims of weather. This was proven last year as the beautiful resort town of Kelowna, British Columbia Canada came under attack when heavy rainfall and spring snow melt caused the Okanagan lake system to rise beyond its normal boundaries. This put the shoreline of Kelowna and the downtown core at risk of flooding. As the water rose US Flood Control was called to bring in their Tiger Dam™ systems to save the beaches and stop flooding of the downtown core. The Tiger Dam™ system is easily stored and can be in place in hours as opposed to sand bags that might take days and that is often the difference between stopping flooding and losing everything. As a city in an area that is high risk for flooding why wouldn’t you have a Tiger Dam™ system on standby and a team trained in implementing the system before the next flooding event occurs? Call us for more information on how to get a Tiger Dam™ system for your city or town and the expert training to put it in place. 1- 504 – 813-7303. Golf courses, beautiful, green and usually built in close proximity to a water source. Golf courses are built quite often along rivers and water sources. It’s mostly for the ascetics. Where the problem lies is these courses are typical placed along the flood plain of these water sources. It doesn’t take a lot of water to make a river overflow. Low laying golf greens and fairways are quickly flooded and flooding water brings silt, rocks and debris that can take months to clean up. Tiger Dams™ are the perfect solution. The fact that they can be set up in 1/5th of the time it takes to manage any other flood control devise, like sandbags, should be a great incentive to find out how Tiger Dams™ can save your golf course. If you had to protect your property from flooding either by rising water tables, hurricane or environmental disaster such as an oil spill, response time is one thing but having the ability to immediately put a deterrent in place can save your property and lives. One of the factors that drives that time line is the difference between sandbags and Tiger Dams™. 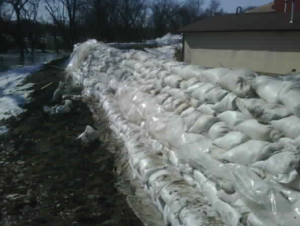 Just the sheer number of sandbags required to protect one mile of ground is a deterrent to their use. Just the fact that Tiger Dams™ can be set up in 1/5 of the time should be a tip as to how effective Tiger Dams™ are. Many memorial sites that are at high risk of flooding or water damage do to their low height above sea level have Tiger Dams™ on site for immediate control in times of storm or high water levels. Places like New York City, New Orleans and Miami to name a few keep Tiger Dams™ ready to go and teams prepared and trained in event of flooding. In the wake of Hurricanes Harvey, Irma and with Hurricane Jose lurking being prepared for flooding is paramount. For immediate response contact us or use the emergency contact button on our home page.